Damifino Candleholder - TT073 [TT073] : No Skew Turns, Gifts handcrafted from the world's beautiful woods. Damifino wood comprises multiple species, none of which can be reliably identified. 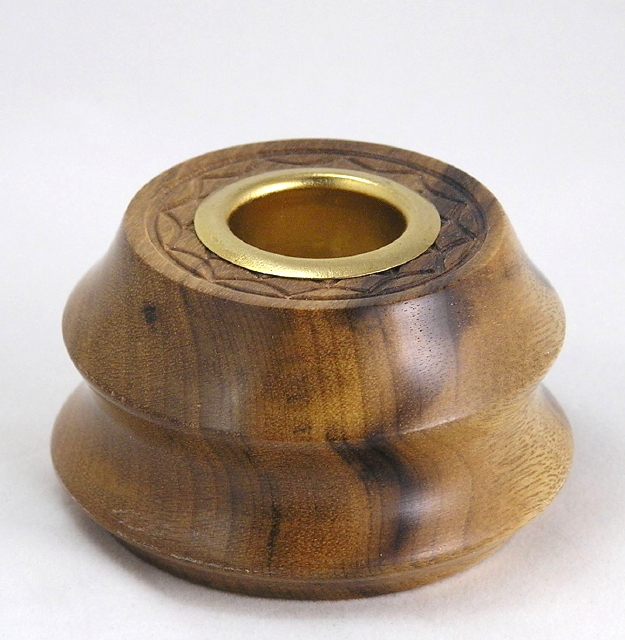 This Candleholder was turned from a recycled Indonesian construction timber. It has a bit of Rose Engine work on the top, and a brass insert to hold standard tapers. 1.5" high x 2.7" diameter. WARNING: BURN AT YOUR OWN RISK! Wood is flammable! Place the candle holder on a non-flammable surface away from drafts. Remember, NEVER leave any candle burning unattended!